I thank the Brian family from Oklahoma for fishing with me today. 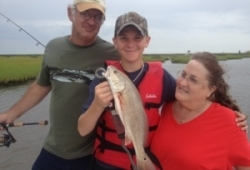 Bill his wife Kathy and grandson Randy all caught fish. Bill and Randy had a competition going all day and Kathy show them how it was done. Thanks to Fransisco and his two friends for fishing with me today. Let’s say it was Colorado vs Idaho and Colorado won this round. 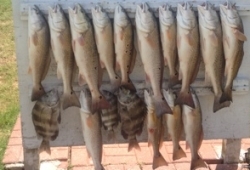 We caught trout, reds, sheepshead and black drum. 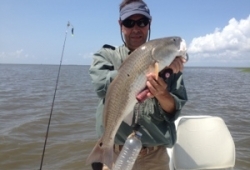 Colorado won with a large Bull Red and Bull Drum that where both released to further the population. Thanks to Heather and Tim from Ohio for fishing with me the past two days. 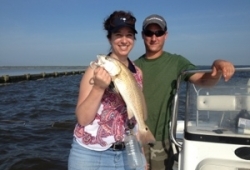 The weather today was beautiful and we went after Redfish and Speckle Trout. We did extremely well south of Lafitte in Mudd Lake. 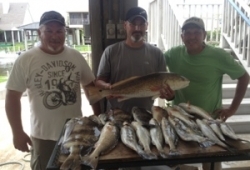 Thanks too Robert and Joe two attorneys from North Carolina for fishing with me the past two days.We kept a nice limit and the guys surrendered after catching over 100 Redfish. Thanks Heather and Justin for fishing with me today. Heather was whooping Justin early but he made a strong come back. Good thing because she was very humble l.0.l. 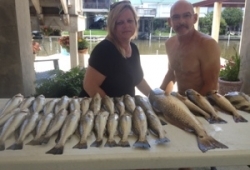 They had a good day and caught a good limit of Reds south of New Orleans. Reds are hitting spinnerbaits today. 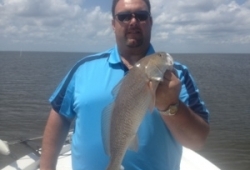 Good reds nailing spinnerbaits in lake south of New Orleans out of Lafitte. Had a group of spinnerbaits purest on board today caught and released twenty reds all on spinnerbaits. WHAT A DAY!!! Had three boys from State Farm Ins. on the boat today a evening trip. 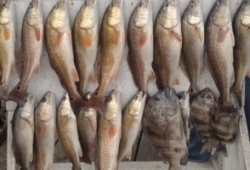 Caught thirty Reds, Sheepshead, Black Drum, and Catfish. 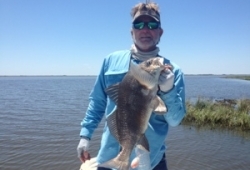 All on board had a memorable trip catch and release south of New Orleans in the Harvey Cut out of Lafitte . Had a nice afternoon trip on Mothers Day. 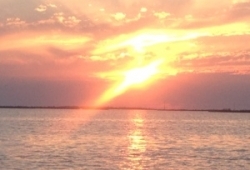 Caught some nice trout and saw a beautiful sun set south of New Orleans in Little Lake out of Lafitte .